We at Hostmaker love it when hosts like Brett come along, as we adore helping people realise how much they can make when they put their home to work! Brett's home is in an ideal location, with brand new, modern furnishings - ideal for the Airbnb market. On his own, he was earning himself modest revenue by following Airbnb's pricing tips. However, at Hostmaker, we helped Brett see just how attractive his home could be for Airbnb guests. Our team ensures that we welcome the right guests, at the right nightly rate, in order to maximise income for the Host and create memorable experiences for the guests. This outstanding service even helped Brett achieve the coveted status of a SuperHost on Airbnb. Our dedicated pricing team experts have seen it all - there’s no calendar we can’t help you price. Even in the low season, we can help your home stand out from the crowd through competitive and dynamic pricing along with our outstanding housekeeping, communication and in-person check-in - you will be sure to have five star reviews! We’re the SuperHost-makers: 20% of our hosts are SuperHosts, compared to the 5% average across the entire platform. SuperHost status enables the Airbnb hosts to get even more bookings at better rates! Understanding the desirability of London depending on neighbourhood and adapting based on events and seasonality. Ensuring we are maximising Brett’s short-term yield - we are the experts in the market. Showing the host that our dynamic pricing strategy controlled by the professionals outperforms Airbnb pricing tips every time! Implemented a competitive price for Brett’s listing, taking into account the performance of our own homes as well as other Airbnb listings in the area. Delivered higher daily rates while occupancy remained high, thanks to our expertise in effective calendar management. Paced the incoming bookings in order to introduce the dynamic pricing strategy gradually and carefully. 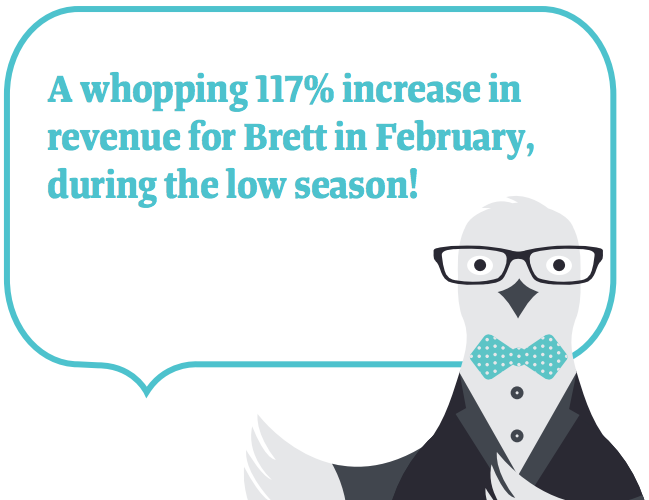 A more dynamic pricing and calendar management strategy, created specifically for Brett's home. A host that trusts Hostmaker to maximise his revenue and maintain his SuperHost status while having his best interests in mind!